Spring is finally here! It’s finally time to enjoy the warmth from the sun, the green grass, green trees, and bugs. Wait a minute! Did we say bugs?! Along with joys of spring, come these pesky critters. How do we get rid of these harassing things? The answer is Neem Oil. Here at Omaha Organics, we seek the safest alternatives to take care of our luscious, green lawns. We are thrilled to offer a safe, organic, biodegradable and non-toxic product, called Neem. Neem is natural pesticide found in the seeds from the neem tree. These trees are native to the Indian subcontinent; to be found in India, Nepal, Pakistan, Bangladesh, Sri Lanka, and Maldives. The active component is called Azadirachtin; its purpose is to repel and kill pests. The remaining component is called clarified hydrophobic neem oil. There are many benefits to Neem oil; used on animals, humans, and plants for a wide range of problems and ailments. We’re here to discuss pesky pests on our lawns and in our gardens. First and most important, this product is safe for kids and pets. Neem oil is non-toxic and you can treat crops and eat them the same day. Neem oil kills insects at all stages of development — adult, larvae and egg. Contact with neem oil stunts the insects’ development by disrupting regulatory hormones. In addition they do not become immune to neem oil. What this means for us is that it will remain effective every time. It only targets the over 200 species of leaf- sucking and chewing insects. Especially relevant Japanese beetles. Consequently, neem oil will not harm bees, butterflies, or ladybugs. In addition, it keeps mosquitos away. Neem oil sprayed onto plants, not only protects them from pests, viruses, and fungi, but also repels mosquitos. However, it’s important not to apply gardening neem oil directly on skin. Safe for vegetable gardens. 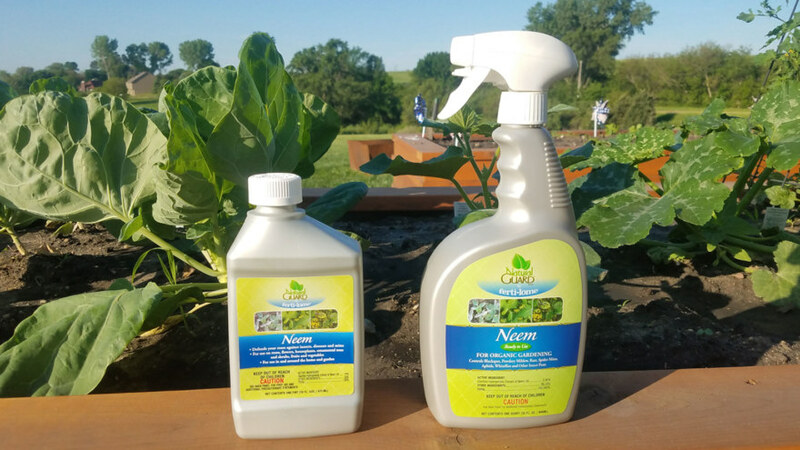 Neem oil can be sprayed on veggies to keep away pests (tomato hornworms, corn earworm, aphids and whiteflies) and fungus (mildew, rusts, leaf spots, wilts, stem rots). Japanese beetles were introduced to the United States in 1916. Ever since, they have been wreaking havoc to our yards and gardens. Adults emerge in June, July, and August. They feed off of over 300 species of plants and will mate in turf areas, leaving eggs wherever they feel like. To stop these pests in their tracks, Neem oil can be sprayed on grass and leaves. Neem oil should be applied in the evening or in indirect light; this will avoid burning to the leaves and allow the treatment to penetrate the plant. For best results reapply every 3-7 days. class="post-template-default single single-post postid-1523 single-format-standard samba_theme samba_left_nav samba_left_align samba_responsive wpb-js-composer js-comp-ver-5.0 vc_responsive"